I’m pretty disappointed that not one person played along with my last post. Doesn’t anyone like to play “Wheel of Fortune?” Well anyway, here is the completed quilt. I think this saying is one of the funniest and most factual sayings I’ve come across. So that probably says a lot about me, and it’s actually true. I hate housework and when you do things you don’t like you look ugly. Plus, I tend to do housework in the mornings before I have taken a shower, and I’m usually still in my sweats. My hair is not combed and I, of course, have no makeup on. So there you have it. 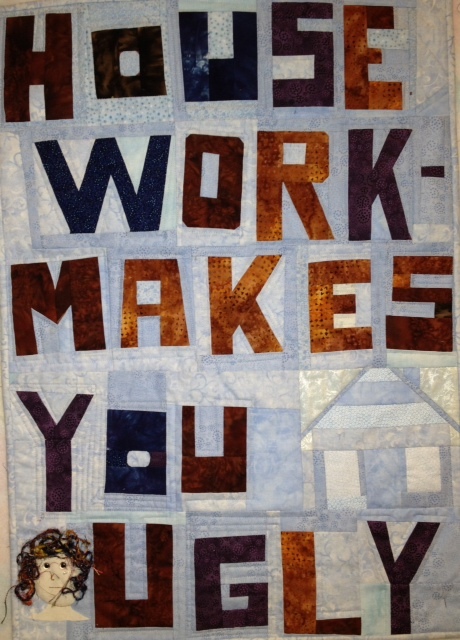 And this quilt makes me smile. I tried to puzzle it out, but my brain was numb! Too numb to leave a reply lol.